Imagine you’re walking down the street and a little yellow envelope appears on your phone. Surprise! You have a message waiting for you four blocks south at Starbucks, it reads. Your mission: get to that Starbucks and get said message. This is the really sweet concept behind HangMessage, the new app that uses location-based technology to virtually leave and receive messages for people. 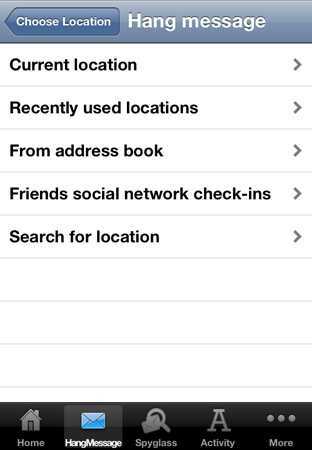 We caught up with founder’s Geoff Cohen and Sergey Kargopolov to talk about their location based social networking app. We learned how Geoff gets his inspiration driving and about Sergey’s dream to go back to university for his PhD. SK: Using location-based technology, users at this time have the ability to hang messages in the air at specific places for friends to pick up and read when they visit the selected location. This new exciting application, now available on both the Apple App Store and Android’s Google Play, comes equipped with an augmented reality camera-view display. 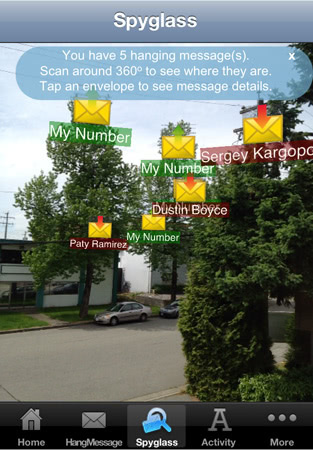 The enhanced perception of reality indicates the position of the surprise text relative to the receiver’s current location, applying a visually appealing graphic of the message secured in HangMessage’s distinct yellow envelope in which users can observe hanging in the air, all in real-time, in a real-world environment. With one touch, HangMessage switches to Google Maps where recipients can start on their journey to retrieving the surprise message with the provided walking and driving directions, making it all part of the fun and games for both senders and receivers. Moving towards a social platform, HangMessage enables users to hang messages for their friends from Facebook and Foursquare by simply tapping on their name under the relevant in-app tabs. Now users can keep up with friends, share experiences in places people have recently checked in to, hang surprise messages then anticipate the receipt confirmation notification indicating that the recipient has returned to that location, picked up and read the message. From surprising a loved one to sending yourself a reminder message to buy milk when you pass by a supermarket or even crafting treasure hunts with your friends to see who can pick up all the messages first, the possibilities with HangMessage are endless. The overall vision for HangMessage is to ultimately bring more fun and joy to communication between friends. We plan to incorporate several new features in the future one of which is introducing in-app purchases where users can buy music and images to hang for their friends. 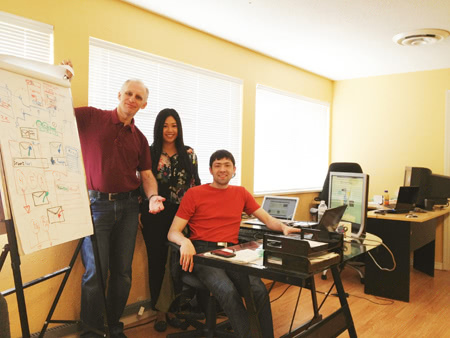 What’s a typical day at HangMessage look like? SK: We are a small team. Everyone has their own tasks and assignments therefore it’s fairly quiet in the office all day. The hours are flexible. Some of us come in at 9:30 a.m., others at 10 a.m. Sometimes we leave at 4 p.m. and other days at 6 p.m. It’s truly a startup environment. Once we arrive at the office, we go directly to our desks. We start with a team meeting if it is needed otherwise we all fire up our laptops and computers and begin our distinguished tasks whether it be coding, marketing or managing the business logistics. The only time we really leave our desks is to grab some coffee otherwise we even eat our lunches at our desks. GC: My goals are what motivate me each day. Apart from one year of the professional portion of my life, I’ve always worked for myself doing some sort of technical startup. Even at 15 years old, I started a television repair service until it ended one day when one TV self-destructed and I had a very angry client knocking on my parent’s door. I don’t necessarily know where I’m going but I have a vision of where I want to be in two, three or five year’s time. I adjust the building blocks along the way, the ideas and the requirements to meet the goal. My motivation is seeing something emerge out of the chaos during the creative process that is coherent and fulfills my vision. My specialty is creating an environment where a team can function and that is another one of my motivation, witnessing a team succeed. SK: I have the constant need to motivate myself by reading up on someone else’s biography or watching documentaries of their lives; Albert Einstein, Michelangelo, Leonardo DaVinci and Nikola Tesla being the most recent. I just finished listening to a BBC audio book documentary about Bill Gates that talks about his childhood, experiences in school and his first days at Microsoft. Reading and listening to someone else’s biography inspires and motivates me tremendously because I become acquainted with another’s successes and their desire to create something that will be great and successful just like how Steve Jobs [said] he [wanted] to create a company or product that outlives him. That resonates with me and I want to do that myself. GC: Always look into government grants. There are many that are relatively attainable, often very under publicized and surprisingly broad in their application. SK: Whatever you’re doing, consider the speed of implementation. You have a vision and your idea. You need to take this idea and focus on the core valuable features. Take it in small steps by making it and testing it. If it is not a hit, switch it. Use the feedback you receive. Don’t build a whole spaceship right away instead do a few things well rather than many things minimally. Release it in the market in a timely manner. Remember not to get discouraged because you start off slow and momentum picks up. You usually put in nine parts of efforts and one part results comes out and soon it shifts where you’re getting more for what you’re doing. GC: Ideas mostly come to me when I’m in the car driving. I listen to stories on the radio such as CBC Spark which will inspire me to take pieces of things, shift and integrate concepts to generate an idea. Ideas also come to me late at night when I’m listening to the radio on the iPad as well. I can’t always be driving. SK: Most of my ideas come to me while I’m sleeping. I can actually write a code to implement a feature while sleeping and when I wake up I just start coding to make the idea reality. I get ideas during the day but it’s all over the place and I’m usually so focused on the task at hand that during my sleep is the only place my mind subconsciously gives me an idea or answer. I clearly don’t sleep well. GC: Nestled in between my many piles of paper is my Macbook Pro. I store everything on my desk. But I can also find anything on my desk in a matter of seconds. The piles of paper are organized though. They relate to different projects such as raising funds for the company. SK: Everything I need for work. A cup of coffee, my Macbook, my other laptop, an external monitor, an iPad, headphones, my “developer’s notebook” where I draw diagrams and things I need to reference to in the future, two mobile phones, a pencil and some loose leaf papers with sketches of my ideas. GC: My brother in law. Simply put, he built up a real estate company in the UK from scratch but still puts family first. There are entrepreneurs that achieve great wealth but they lose people in the process. I admire that he managed to achieve something extraordinary while maintained balance in his life. 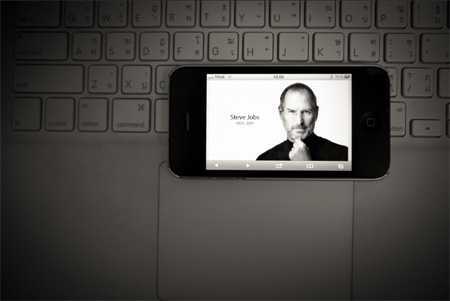 SK: There are two people that I admire, Steve Jobs being one of them. I took note of his life and his works more in-depth following his passing. I admire his spirit. He is a true entrepreneur because in conditions of extreme uncertainty, he still believed and pushed his ideas despite being challenged by some people saying his [ideas weren’t] what the market [wanted]. 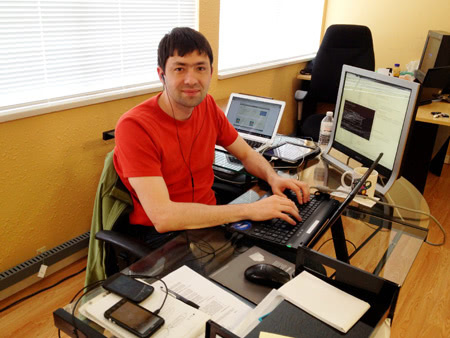 The second entrepreneur I admire is my friend Konstantin Gorozhankin from Kazakhstan. His persistence and all the projects he undertakes are very admirable. 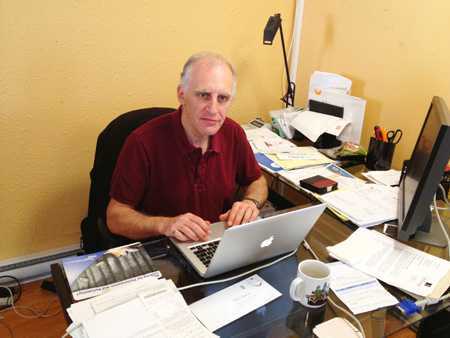 He does things that haven’t been done before and most of them have to do with finance and mobile banking. Problems that he has to solve are difficult mostly because they involve large institutions such as the banks and government. His ability to push, round up resources and communicate at the national and international level is commendable. He doesn’t get scared and he does what he has to do. He never takes no for an answer and doesn’t get discouraged if his projects take a year or two years to build. Not only that but he always has several projects going at once and has a family. GC: I would head back to Africa again. When I had large amounts of money in the past, I’d say I have given 50% of it away funding what I was doing before which was setting up links, networks and communication. Setting up PeaceNet and GreenNet was one of the happiest moments in my life and if I have a year off I’d go looking for projects that I can participate in. I want to get involved with the UN work I was doing before. SK: I’d go back to university. I won’t be able to finish it in one year but I want to get started on my PhD from a good university. Since I’ve graduated ten years ago, everything I learn now I learn myself from blogs. GC: I’m not putting anything on hold. This is my life. I’ve always created things. This is what I’ve done before and this is what I know. SK: What drives me is my want to create a product that is accepted and loved by lots of people. I could be travelling but it’s not what I want. If I get a Saturday and Sunday free, I work. I research the possibilities of realizing my ideas. What gives me confidence is that this project will be successful. If not, then I will learn and my next project will be successful. GC: Nothing stands out for me so there must be no regrets. If I could, would I do some things differently? Of course but that’s just 20/20 hindsight. SK: No. There are no regrets. It’s always a learning process. What advice do you have for other entrepreneurs struggling to get their businesses off the ground? GC: Be willing to make adjustments to the fundamental structure of the project rather than give up. Don’t be too attached to being right about what it is that will work. SK: To start, ask yourself why you’re doing what you’re doing. Next have a clear vision of the end product that you want. If you’re trying to solve a problem then talk to people who you think would have this problem to make sure it is actually a problem. And to how many people is this a problem? Learn from the feedback and adjust. Finally I’d suggesting reading these two books: Rework by 37 Signals and The Lean Startup by Eric Ries. SK: 1. Eben Pagan. He gives wonderful advice on productivity and creativity to improve and manage your life. 2. Pete Cashmore. He’s like a newspaper. You get the facts without going to the website. 3. Mike Myatt. He is one of the top CEO coaches. It’s useful to follow him. Where can our readers get reach out to you? Thanks guys! Make sure you check out HangMessage and virtually surprise your loved ones next time they go get a cup of joe down the road.